every/nowhere is an immersive, improvised performance for an intimate audience of 10, presented in a white gallery space or studio which attempts to frame and present a narrative of in-between places: between here and elsewhere, past and present. Derived from the practices of mapping and walking, the performance blends improvisation, poetry, audio-described soundscore, and guided interactions. 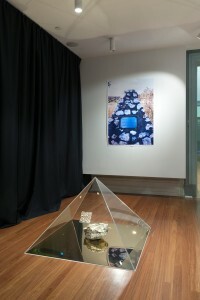 The work embraces displacement of the self and site, and examines the nomadic subject in the formulation of identity. The performance is an immersive experience for the audience, who are guided into the space one at a time at 2 minute intervals via an MP3 player that delivers a mixture of audio description, autobiographical reflections and guided participation which aims to destabilise the notion of space and time. The experience of the audience is unresolved; they encounter a performance already in progress, with no start and no end, an ongoing improvisation that incorporates the movements of other bodies in spaces. every/nowhere attempts to weave an unstable narrative that has at its heart the question of what it means to create a “sited” (rather than site-specific) work. Drawing from theories of space and place, mapping, displacement and nomadism, a central concern of the performance is the process of continual negotiation of self to surroundings, and the pull between the known and the unknown. The work creates a fluidity of spatio-temporal relations in order to draw greater attention to the productivity of the in-between. As the reflection of a personal narrative, every/nowhere embraces shifts in consciousness, and in particular an attention to these attentional shifts. Displacement is reformulated as an ongoing creative process, which recognises the continual fluctuation between past and present. The in-between place is therefore able to serve as a source of renewal, forging a path between identities, places and states of awareness. A sectional walking and marking of a migration landscape.